We were presented with a choice of two starters and two mains. 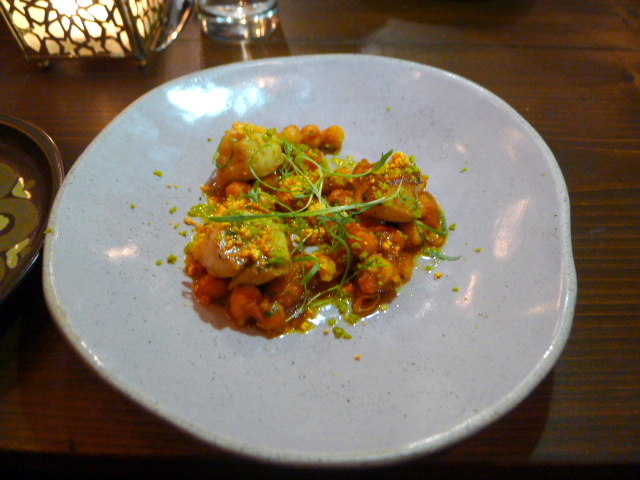 My starter was the pan-fried scallop chermoula with chickpeas, tomato and cumin (£12.95). I found the dish to be nicely spiced. However I was lukewarm on the scallops themselves which could have done with greater caramelisation for added flavour. What’s more, these weren’t the greatest quality scallops around. 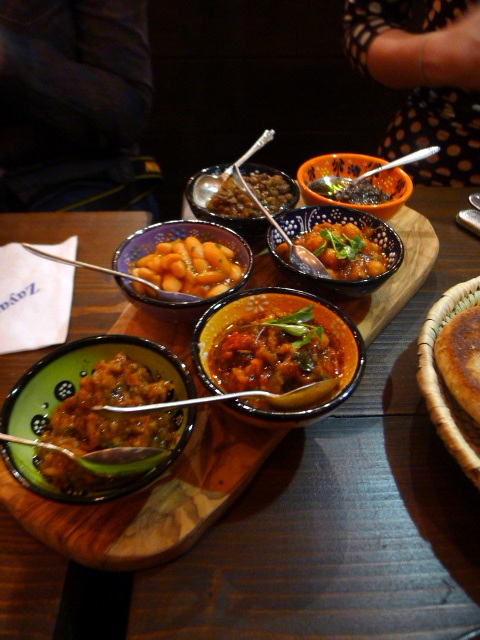 The Zayane Platter (£11.50) was the other starter, a selection of six Moroccan dips with hot flatbread. Each dip was nicely prepared and showcased a good mixture of flavours. My favourite was the smoked aubergine dip which was wonderful. 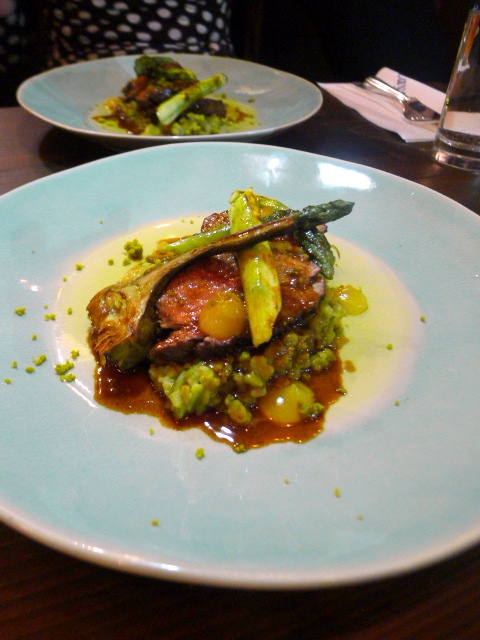 My main was a milk-fed lamb mechoui with artichokes, asparagus and preserved lemons. The lamb was tasty and tender, with each of the accompaniments being well cooked. The use of preserved lemons was an unusual touch but it worked well enough with the dish. The other main was saffron marinated sea trout, cauliflower and couscous (£12.95). This dish was a little lacklustre and rather bland, particularly the couscous. It needed a sauce to bring all the elements of the plate together. To me, this was a failed attempt at Moroccan. 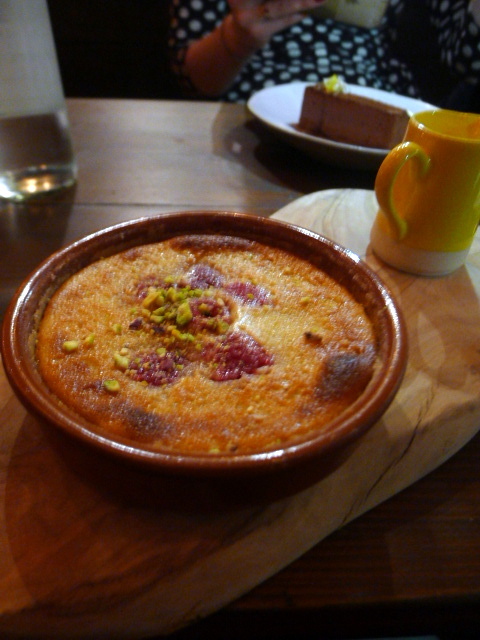 My dessert was a raspberry clafoutis with vanilla pouring cream (£7.50). I really enjoyed this dessert. It was a nice tasting pudding and not too sweet. But texturally it was a little soft and taste wise it was a touch too eggy. 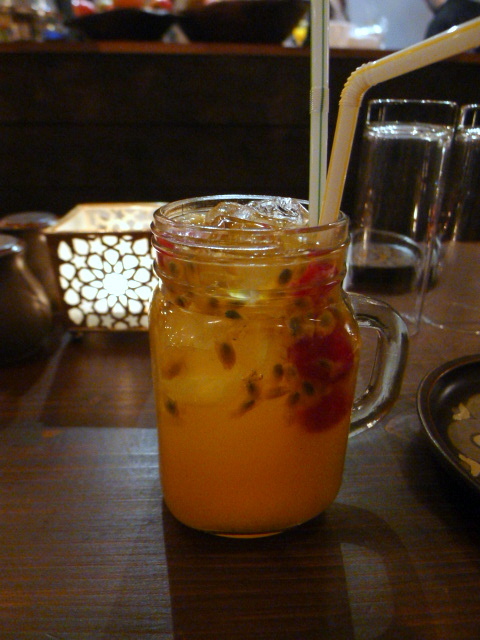 I enjoyed the ambience and the atmosphere at Zayane and I thought the service to be very welcoming and warm. The food was pretty decent overall, but it could do with some improvement in certain areas. And I also found its claim to be modern Moroccan to be quite confusing. In some respects I thought the food was trying too hard to be something it wasn’t, ie, it was really British cooking with Moroccan inspirations and touches. Zayane is a good neighbourhood restaurant should you happen upon it by chance. 3) The restaurant feels very Moroccan but the integrity of the food doesn’t quite reflect the decor. Prices: £37 to £53 for three courses, excludes drinks and service.